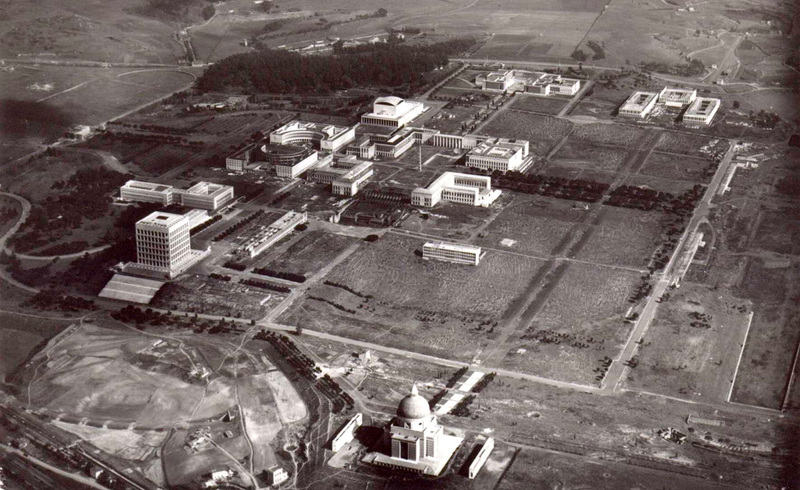 The resort made to host the Universal Exposition of Rome (to celebrate the year 1942 and thus known by the acronym EUR 42) exponent is a key to understanding the aesthetic ideas of the fascist regime of Benito Mussolini wanted to impose in relation to planning. The EUR 42 was screened in the south of the city towards the coast, for which establish a direct communication infrastructure to the center of Rome around the Colosseum and Ostia seaside, at its other end. It would be by calling Via Cristoforo Colombo Imperiale or to impose its trace over the forums beyond the old Urbs without any regard to its heritage status. A monumental communication axis, punctuated by rows of trees (the characteristic umbrella pines that are native to the Lazio) all the way, that would link the new urban space with the existing metropolis center and only be held partially. The fascist state convene the meanings and brilliant architects of the time to implement this new part of the city. The physical definition and some of the important buildings are the responsibility of the team led by Marcello Piacentini to be composed of people as relevant to Urban twentieth-century Italian Giorgio Piccinato, Giuseppe Pagano, Sergio Muratori, etc.. The planned design of this urban space strongly propagandistic character would be based on the definition of large landscaped road axialidades generated powerful focal prospects at their ends. The basic building arise on a lattice grid of rectangular blocks ordered with a geometric regularity and would be traversed centrally in a hierarchical and dominant on the Via Imperiale's way Thistle contemporary. 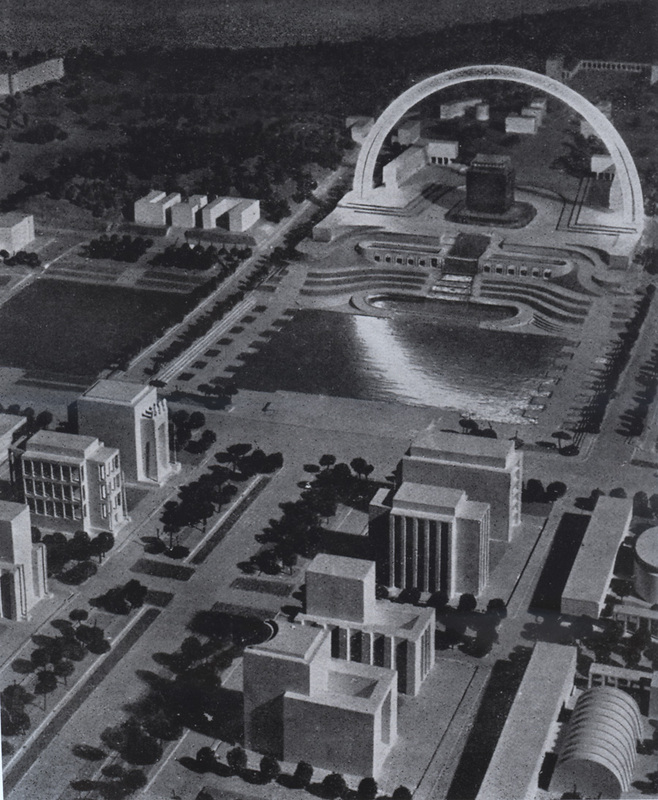 The water would also have a significant role in shaping the area with a large lake at one end capped with an immense monumental arch that never get built. The most representative buildings would be made within the line of Italian Razionalismo, whose formal patterns respond to the aesthetic that imposed Piacentini. This rational style was derived from a simplified form of the elements of classicism, whose orders and figurative resources have been present in a recurrent throughout the history of that country. 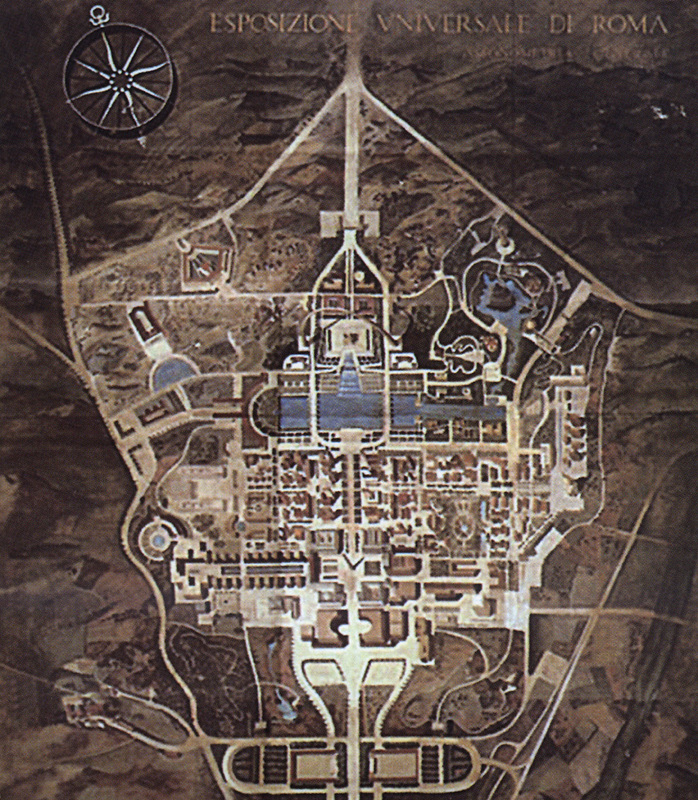 The most notable works are called Palazzos of the Italian Civiltá Guerrini, Bruno Romano; Congress of de Libera de 1940; el Central State Archives de Renzi, Figini and Pollini and tertiary volume set that compose the central part of the composition in the large square around the obelisk commemorating Marconi. The entry into the war of Italy, as an ally of Germany as part of the Axis in 1940, paralyze the proceedings of the assembly being largely inconclusive. 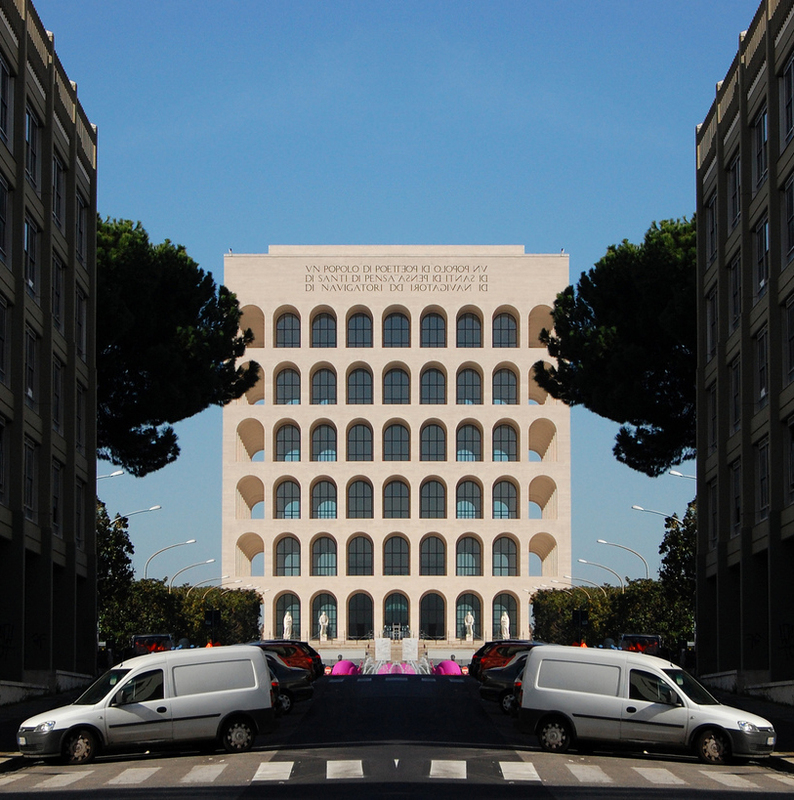 In 1953, had barely finished defining the central axis of the large development planned and had managed to build a small group of former buildings, to which add three years after the formidable Palazzo dello Sport of one of the great geniuses of the concrete structures of the twentieth century, Pier Luigi Nervi. Also be incorporated after the Museum of Roman Culture, Established in 1955, Aschieri architects, Bernardini, Pascoletti y Peresutti. The latter has an interesting model that reflects the way and monuments in the imperial era. Beyond the political implications for the U.S. plan 42 generate an urban area of ​​high quality that today is one of the best places of the Eternal City urbanized. Partial view of the model of the project in which shows the great monumental arch.